Frustration led to revelation when Rice University scientists determined how graphene might be made useful for high-capacity batteries. Calculations by the Rice lab of theoretical physicist Boris Yakobson found a graphene/boron anode should be able to hold a lot of lithium and perform at a proper voltage for use in lithium-ion batteries. The discovery appears in the American Chemical Society's Journal of Physical Chemistry Letters. The possibilities offered by graphene get clearer by the day as labs around the world grow and test the one-atom-thick form of carbon. Because it is as thin as possible, battery manufacturers hope to take advantage of graphene's massive surface area to store lithium ions. Counting both sides of the material, one gram would cover 2,630 square meters, or nearly half a football field. But there's a problem. 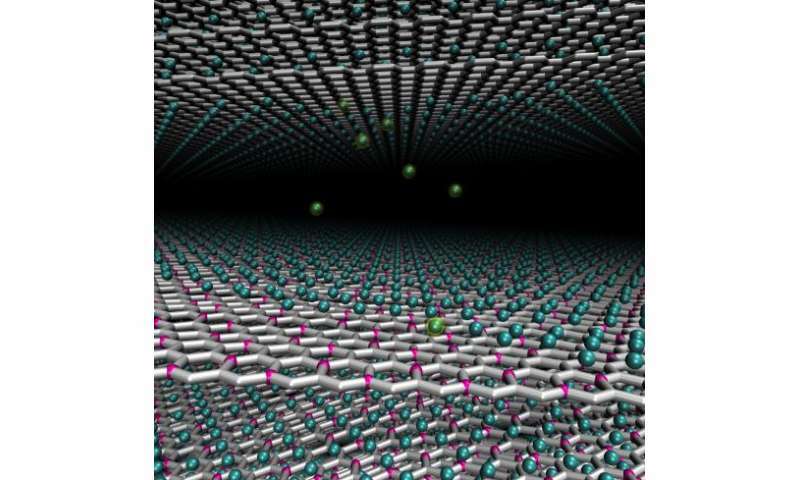 The ions don't stick to graphene very well. "As often happens with graphene, people oversold how wonderful it would be to absorb lithium," said Yakobson, whose group analyzes relationships between atoms based on their intrinsic energy. "But in experiments, they couldn't see it, and they were frustrated." Scientists at the Honda Research Institute, who are interested in powerful batteries for electric cars, asked Yakobson to view the situation. "We looked at the theoretical capacity of an ideal sheet of graphene, and then how it could or could not benefit from curvature (into a nanotube) or topological defects. Our initial expectation was that it would improve lithium binding. "But the theory didn't show any significant improvement," he said. "I was disappointed, but the experimentalists were satisfied because now their observations made sense." Calculations involving graphene with defects, in which the honeycomb array is disrupted by five- and seven-atom polygons, fared no better. "So we decided to explore defects of different types where we replace some carbon atoms with another element that creates more attractive sites for lithium," he said. "And boron is one of them." A carbon/boron compound in which a quarter of the carbon atoms are replaced by boron turned out to be nearly ideal as a way to activate graphene's ability to store lithium, Yakobson said. Boron attracts lithium ions into the matrix, but not so strongly that they can't be pulled away from a carbon/boron anode by a more attractive cathode. "Having boron in the lattice gives very nice binding, so the capacity is good enough, two times larger than graphite," the most commonly used electrode in commercial lithium-ion batteries, he said. "At the same time, the voltage is also right." Yakobson and Rice graduate student Yuanyue Liu, first author of the paper, calculated that a fully lithiated sheet of two-dimensional graphene/boron would have a capacity of 714 milliamp hours per gram. That translates to an energy density of 2,120 watt-hours per kilogram, far greater than graphite, when paired with a commercial lithium cobalt oxide cathode. They also determined the material would not radically expand or contract as it charges and discharges. "In this case, it seems quite reasonable and exceeds—theoretically, at least—what is available now," Yakobson said. An important step will be to find a way to synthesize the carbon/boron compound in large quantities. "It does exist, but it's not commercially available," he said. Yes this is a flippant comment not intended to be taken seriously or create offence but I can't resist it. I'm waiting for Graphene to be nominated as the next wonder food as it appears that there is nothing it cannot do. Radium once once held in awe and had a wonderful run as a cure-all until they realised it was lethal. Have a good day and in the words of the TV character Sheldon Cooper, "What's life without whimsy?". I worked out that my yacht with it's 10kW motor could go for 21 hours on 100 kg of the stuff. (Not counting regenerative braking) Let us hope that they manage to make the Lithium stable. Fire on a yacht is not good. Regenerative braking on a yacht? And where do you find a downhill sea?